Xufeng Porcelain is a manufacturer who making various porcelain items for more than 20 years. The porcelian items are FDA approval, simple and elegent design suitable for dinnering environments. Packed Set of 4 with safety mail box packing. Lead and cadmium free. We are always try our best to offer you good quality with better price. Xufeng ensures you get what you pay for. We are offering 30 DAY NO CHIP WARRANTY, if there is anything wrong with your items, just feel free to contact us at any time for a full refund or a free replacement. Set of 4 Porcelain Round Dinner Plates with Elegent Design Suitable for Individual Serving like Pasta,Salad, French Fry and Steak. 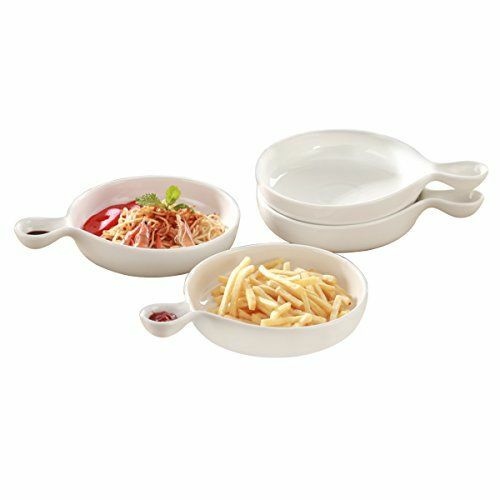 Modern Design White Deep Pasta Serving Plate Set with Handle. The Handle is Convenience when carrying the food from Kitchen to the desktop. The Handle is also for Chip and Dip purpose. Put saucer inside the Handle then start your Perfect Dinner experience. STACKABLE and EASY CLEANING- They are stackable for easy storage to save space in your cupboard. Shiny and smooth enamel make they easy to clean by dishwasher or by hand. FDA APPROVAL SAFE FOR DISHWASHER, MICROWAVE, OVEN AND FREEZER- Durable porcelain items are through 1350 degree degree centigrade’s fired. Lead and Cadmium free. The durable material are chip-resistant than other porclain items.